The new era of Warhammer 40,000 is here, and with it a new era in the background and fiction for the grimmest and darkest galaxy out there. 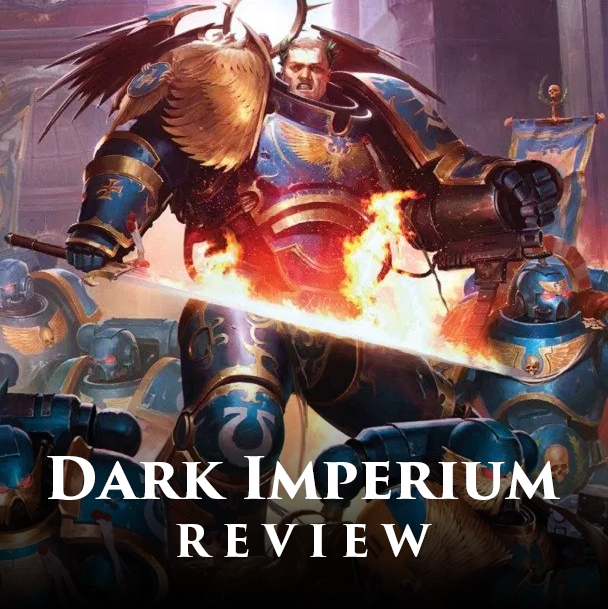 Dark Imperium by Guy Haley is our first glimpse into this newly evolving storyline, focusing on Roboute Guilliman around 100 years after the launch of the Indomitus Crusade. So how is the thirteenth Primarch dealing with life in the 41st (42nd now?) millennium and the resurgence of Chaos? This amazing novel is divided into three parts, and man oh man is the first part great. These couple of chapters could have been a novella on their own and it would have been a fantastic read. The story opens up nearly 10,000 years ago after the scouring, with Guilliman leading the Ultramarines and some of their brother Chapters on a hunt to finish off his corrupted brother, Fulgrim. Anyone familiar with the lore of the Ultramarines knew what event this was depicting from the get go, and I was super excited to finally read about it on the page. Lead into a trap, Guilliman decides that he must risk teleporting aboard the Emperor's Children's flagship to prevent his brother from escaping again. The horrors and wounds of the Heresy are still very fresh in everyone's minds at this point, and we even get some returning characters that fans of the Heresy series will be familiar with. This was a nice nod and a great way of creating continuity. There are some great bits in here where Guilliman reflects on the difference of the veterans from the Heresy and the newer recruits to the Space Marines. Those newer to the ranks revere him more and hold him in an almost holy position, something that makes him deeply uncomfortable. This is a theme we'll see pop up several more times throughout the rest of the story. Roboute quickly realizes the whole thing is a trap but decides that he must fully commit and heads into Fulgrim's throne room alone, although he does concede that he will call for help if he feels the need. It was always fascinating reading about the Primarchs interacting in the Heresy series, and here we see two confronting each other for the first time since that war. This is also the first time Guilliman sees Fulgrim in his new Deamon Primarch form, though he knew of it ahead of time. There's so much great content here, but as anyone familiar with 40k history knows, there was only ever one outcome. Even after calling for help he is still no match for Fulgrim and after a brief fight, the Ultramarine's Primarch is laid low with a slash across his throat. This scene of him dying is great, as we see it all from his perspective. His incredulity at the idea of his death, the sadness he feels for his sons he's leaving behind, the panicked actions of the Space Marines trying desperately to save him and get him to safety, the thought of what will befall the Imperium without him there to guide it, and most surprisingly of all, the panic and almost fear of death itself. It's a real great scene, and I would almost say the best scene in the book, but there is still so much more to come. The death of a Primarch would be a powerful scene on its own, but the fact that we experience the whole thing from the perspective of the man dying just adds an emotional wallop that you wouldn't expect. Act two cuts to the current timeline, with Guilliman already restored to life during the events of the Gathering Storm and now wrapping up his 100 year long Indomitus Crusade. The main plot of the story sees the final battle in the crusade, where we also meet Captain Felix, a Primaris Marine and Guilliman's equerry. This is where we first dig into the Primaris Marines and the way Guilliman has organized them. They are essentially a pseudo legion called the Greyshields and are doled out to the chapters they share a geneseed link with in need of reinforcements or organized into entirely new Chapters as the crusade goes on. At the end of it all we get to see Guilliman's brief triumph declaring it finished before taking a good chunk of the crusades forces and heading back to Ultramar which is currently under siege by the forces of the Death Guard. It's hard to sum up the rest of the story here without going into too much detail, but essentially Guilliman must reestablish a secure foothold in his own realm and push out the forces of Mortarion, who is personally leading them. There is also a cool subplot about two guardsmen who are on Iax to recover from wounds and diseases on the front line that has a grimly satisfying conclusion. The main story itself doesn't culminate in the titanic battle you might think something like this should, but that was never the point of this book. Dark Imperium is all about the characters and the setting. The plot is great, and I was never bored by it, but the character exploration is where it's at, specifically Guilliman. Even after being active in the 41st millennium for around 100 years, the Primarch is still a man thrust into a time he doesn't fully understand. On Twitter I jokingly summed up the story as being about a man struggling with faith and family all while adjusting to a foreign and strange land, and I think that's fairly accurate. Some of the best moments in this book come from quieter scenes when Roboute is dealing with bringing order to a chaotic galaxy. There's some great stuff in here, like an new organization he's created to re-document history and separate fact from fiction. He's horrified to find out how much of the Imperium's history has been lost or filtered through metaphor. Being a man of logic and reason this won't stand and he wants to set all the records straight. They're not even sure if the date is correct. There's an amusing part in here where Guilliman tries to teach the Imperium that a lot of the sayings and actions attributed to him are not true, yet they still don't want to believe it. He's essentially a man out of time, and doesn't really like a lot of what humanity has become in the 41st millennium. The hardest thing for him to deal with is the religion surrounding his father. Again, despite him telling them multiple times that the Emperor is not a god, and has said so Himself, they refuse to listen to him. This leads to several moments of near crisis where he starts questioning himself. Maybe the Emperor is a god and was just lying to him, since he now knows that the Emperor was lying about a lot of stuff. In fact, Guilliman's attitude towards his father can best be described as angry. We even get a few glimpses at what may have transpired when Roboute went into his Father's throne room. It's all really fascinating and I can't wait to see how a lot of these story threads are played out in the new setting. There's so much potential for conflict just simmering under the surface. Guilliman isn't the only fascinating character though. Felix, the Primaris Captain we follow, gives us some insight into what the new Primaris Marines think of everything. For one thing, they're not new. Just like Guilliman, they are a bit of a fish out of water since most of them were created back around M31 or M32 and have been in and out of stasis since then. To them the current state of the Imperium is just as strange. There are multiple times that the over the top nature of decor in the 41st millennium and how macabre it is comes off as odd to those who remember the Imperium immediately after the Heresy. Marneus Calgar also make an appearance near the end of the story with some insight into how he's dealing with meeting his Primarch and essentially being replaced as the head of the Ultramarines and Ultramar. Calgar has never really felt like an interesting character to me in the past, but here he really shines. I hope we get to see more of his interactions with Guilliman and the new world order. He essentially feels like a man who is quickly becoming obsolete and is acutely aware of it. There are even more Ultramarine characters who get a moment in the spotlight, including my all time favorite who makes a special cameo appearance, but I don't want to ruin the surprise. The handful of mortals we deal with are interesting as well, especially Mathieu, a member of the Ecclesiarchy who Guilliman appoints as his representative within the church. He's a very pious and fanatical man, but also one who is smart and knows how to play the situation with the non-believing Guilliman. On the Chaos side of things we briefly get to see Mortarion, who I would definitely like to see explored more. The standout for me though was his wayward son, Typhus. It's great to see how Typhus deals with his Primarch and it's not exactly what you would expect. This is another relationship I'm excited to see played out more in future books. At the end of the day though, this book is Guilliman's. It's a fantastic look at how a Primarch deals with the absolute craziness of the 41st millennium, and also how the changing times affect everyone. There's so much potential to mine with the interaction of the new Primaris Marines and the older Space Marines. I could read an entire book of just Guilliman and the rest of the Ultramarine chapters interacting with each other in meetings and tactical sessions. It's all so fascinating and well written and really adds a new twist onto the familiar 40k formula. I can't wait to see some more non-Ultramarine chapters drawn into the action and how they handle Guilliman's return. Dark Imperium is an absolute, no excuses, must read for any 40k fan. It's not only a pivotal moment in the history of 40k, but it's extremely well written as well, and will make you care for each of the characters in it. Guy Haley has already confirmed that he will be writing two more books in this series, and I eagerly await them. If you haven't read Dark Imperium yet then drop what you're doing right now and pick it up, it's seriously that good.